Luann Prokop was 53 years old when she was laid off from her job as an accountant at a manufacturing company in Pottsville, Pennsylvania after it was taken over and restructured by a multinational corporation in 2009. After depleting her unemployment benefits, savings, and retirement accounts to pay her mortgage and feed her two teenage children, she still could not find a job. “I had a good, solid background and fabulous references,” she said, “but I got rejected from jobs I applied for over and over again. It was a difficult, dark period.” She started using the local food pantry so that her family could still have meals. Eventually she took an accounting job at the center that housed the pantry, making $20,000 per year when a few years earlier she had earned $60,000. She could get food stamps, but she was not able to qualify for other government benefits, and she worried that she would not be able to pay for heating during the upcoming winter. Stories like Luann’s are common in America today where globalization and growing income inequality have hollowed out the middle class. According to the U.S. Census Bureau, 15.1 percent of Americans lived below the federally defined poverty line by the end of 2010. Thirty four percent of single mothers and their children were in poverty, up from 28.5 percent in 2000. The rise of poverty and the decline of environmental protections are two correlating trends that are infrequently spoken of together. They are usually seen as unrelated, sometimes competing issues. Economic growth, even when it helps billions have better lives, is generally seen as bad for the environment. For social justice advocates, worrying about climate change and biodiversity are luxuries for people who don’t know where their next meal is coming from. By some accounts, poverty is even said to be good for sustainability. As billions of people in the developing world gain access to a middle class lifestyle, carbon emissions, meat consumption, and pollution have all skyrocketed. However, the history of the United States in the last century shows that the middle class and environmental protection flourished during the era of progressive government after World War II and deteriorated in the period of conservative backlash that followed. Beginning in 1950, a wave of progressive reform created programs that benefited the middle class such as social security, Medicare, low interest home loans and public higher education. The American Dream became reality for a generation of Americans as huge portions of the population received higher education, bought homes, and could retire in financial security, funded in part by taxes as high as 90 percent for the wealthiest 1 percent of Americans. Wide sweeping environmental legislation such as the Clean Air Act, the Clean Water Act, and the Endangered Species Act were passed by Republican presidents in response to the industrial excesses of the previous generation. The first Earth Day was instituted in 1970, and laws banning the use of DDT and ozone destroying chemicals were passed. Feminism and the Civil Rights movement also toppled conservative values in politics and culture. These changes protected the environment, reduced income inequality, and raised standards of living for all. By 1980, a conservative backlash took hold in think tanks and drawing rooms across the country. Neoliberalism, an ideology defined by belief in the virtues of an unregulated free market motivated only by profit, came to dominate conservative thinking. The election of Ronald Reagan in 1980 cemented neoliberalism in the nation’s highest office of power. The Reagan administration instituted huge tax cuts to the rich and corporate deregulation. It promoted a “trickle-down” economics that made sure that economic growth disproportionately benefitted the wealthiest of Americans. 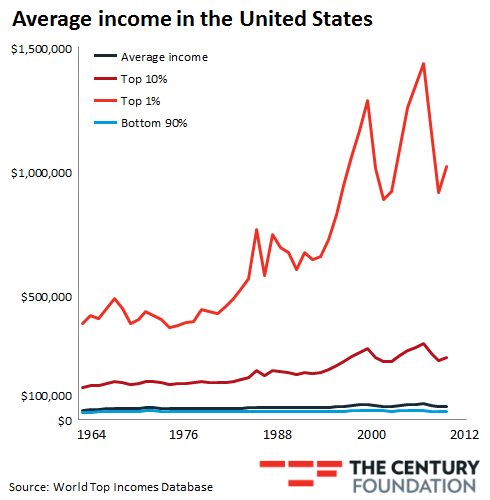 Income inequality soared. The median annual wage in America fell from $33,000 to $26,364 a year from 1973 to 2010, a 20 percent decline while the wealthiest one percent of Americans saw their incomes increase by 275 percent between 1979 and 2008. Historians are saying that income inequality today is as high as it was during America’s Guilded Age, when industrial capitalists built huge mansions in Newport, Rhode Island while millions lived in the slums of New York City. During this same period, environmental protections in the United States suffered a similar decline. Only three federal environmental statutes were passed after 1980 as compared to thirteen in the two decades prior. Greenhouse gas emissions continued unabated despite decades of warnings from scientists of the dire consequences of climate change. Between 1990 and 2013, total US greenhouse gas emissions increased by 7 percent, despite massive outsourcing of the manufacturing sector. Twenty five years after the Exxon Valdez oil spill, which dumped 10 million gallons of crude oil into Prince William Sound, there has been at least two dozen major oil spills in the United States, the largest of which was the Deepwater Horizon oil rig explosion of March 2010, which killed 11 people and dumped more than 200 million gallons of crude into the Gulf of Mexico. Political support for fracking has ushered a whole new age of environmental deregulation in the United States. Since 2005, fracking has been exempted from parts of the Safe Drinking water Act, the Clean Water Act and the Clean Air Act in a set of policies known as the “Halliburton loophole.” Existing standards only apply to drilling on leased federal land and land owned by American Indian tribes, which account for less than a quarter of the country’s oil production and 17 percent of natural gas. Fracking has enabled industry to siphon a huge supply of fresh water from our commons. Nationally, nearly 92 billion gallons of water were used for fracking between January 2011 and February 2013. 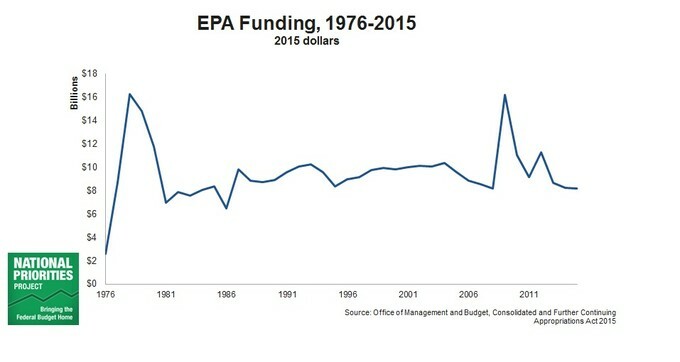 Funding for the Environmental Protection Agency, probably the clearest indicator of the federal government’s commitment to environmental regulation, is a fraction of what it was at its peak in the 1970s despite huge growth in the number of industries needing to be regulated. The FY2015 EPA budget is nearly 30 percent below what it was in FY2010 and its staffing level is the lowest the department has seen in 25 years. The number of EPA inspections has also declined since 2005. In a recently-issued draft strategic plan, EPA indicated that it intends to place a greater reliance on so-called “Next Generation Compliance Strategies,” by which it means self-regulation by industries along with enhanced public information. At the same time, law makers stipulated $380 million to renewable energy research in the FY 2015 budget while providing $498.5 million to nuclear energy research and $571 million to fossil fuel research. In an all-of-the-above energy strategy, it is clear which fuels law makers favor. When the majority of Americans are squeezed financially or fallen into poverty, democracy suffers. When democracy suffers, social programs like environmental regulation and welfare suffer as well. Poor people are disenfranchised because they do not feel confident in their ability to make a difference, they are isolated socially, and they do not have the time to learn about social issues, candidates, and how to take action. In a country where access to communication, transportation, and healthcare are privatized, large segments of the population become virtually invisible. The poor are not able to get help from the government and so they no longer seek help. They become outcasts in society, putting up with whatever indignities are heaped upon their person or their environment. Meanwhile, corporate giants are able to give millions of dollars to political campaigns to ensure that candidates that espouse their causes get elected and impoverish the poor even more. Poverty also makes communities more susceptible to exploitation by corporations that want to take advantage of their natural resources. Wealthy communities are able to use their social and political capital to impose not-in-my-backyard resistance against corporations that want to dump toxins into their rivers, construct landfills near their schools, and sell their wildlife refuges for property development, capital that poor communities do not have. Communities that depend on industries that destroy the environment for their livelihood are especially at risk, such as communities in the vast region of Appalachia dependent on coal mining for their economy. The fracking industry is similarly using its economic leverage over communities by buying out homeowners for the right to drill on their land. When residents are faced with the health effects of contaminated water supplies and air pollution the same corporations buy their silence with nondisclosure agreements. On a purely financial level, sustainability requires investments of upfront capital that simply aren’t available to the poor. A low income household does not have the money to install solar panels, buy new energy efficient appliances, or insulate homes even when these actions save money in the long run. The poor eat cheap food and skip preventative health care which leads to chronic problems. At the level of state and local government, communities that cannot invest in energy efficiency, pollution prevention, and biodiversity see their environment deteriorate to the point where wealthier residents no longer want to live there, resulting in a declining tax base that leads to even more poverty and unsustainability. The desire for the cheapest short term option in planning and development can lock in patterns of high energy consumption for decades to come. What about the argument that if everyone were to live a middle class American life we’d need ten planets? Isn’t a growing middle class an environmental nemesis? Yes, if we are talking about a particular kind of American middle class life that is all about driving SUVs and living in McMansions. But a high standard of living does not have to have a huge carbon footprint, and a modest standard of living would be a huge improvement for the millions that currently struggle with homelessness and poverty. 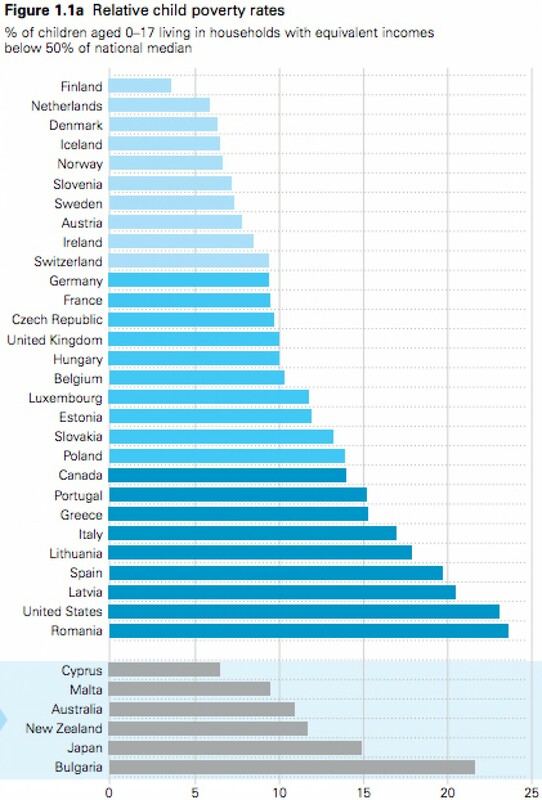 In the UK, for example, where the child poverty rate is less than half of what it is in the United States, per capita greenhouse gas emissions in 2009 (8.5 tonnes ) is also less than half that of the United States (17.2 tonnes). How do they do it? With smaller, denser housing arrangements, excellent public transportation, and high fuel efficiency for their vehicles and utilities. Scandinavian countries such as Denmark and Sweden, which have the lowest child poverty rates also have the smallest carbon footprints of developing countries. Their quality of life comes from having universal healthcare, guaranteed retirement income, access to free higher education and quality childcare, and rich cultural institutions rather than lots and lots of stuff. Poverty and unsustainability are both outcomes of the same ideology that created the corporatized world in which we live today. They are both characterized by exploitation of the commons, the privatization of public assets, and the externalization of costs in order to maximize profits. In the name of freedom, neoliberalism gives the strong license to plunder the weak. Like colonialism, it allows those with superior weapons to conquer those who don’t have the power to resist, such as the poor, other species, and future generations. Combating poverty and unsustainability requires adopting policies and practices that are the reverse of neoliberalism. These include investing in the commons, redistributing wealth, and internalizing the cost of externalities. Invest in the commons: The commons includes our shared environment such as the atmosphere, oceans, rivers, forests and open spaces. The commons also includes man-made assets such as public parks, streets, public transit systems, public schools and universal healthcare. They are benefits that everyone can access at little or no cost. This winter we witnessed the devastation that underinvestment in public transit caused to cities like Boston whose roads were paralyzed by apocalyptic levels of snow. We also witnessed what happened when decades of wetland destruction left New Orleans and the Gulf Coast vulnerable to hurricanes. In addition to preserving wilderness and the atmposhere, at the micro-level, planting a tree is improving the commons; installing a recycling bin is improving the commons; adding a bike lane is improving the commons. The more sustainability can benefit everyone and not just the rich the better. Redistribute wealth: It doesn’t benefit anyone for wealth to be concentrated in the hands of a few. The wealthiest people cannot spend enough money to make much difference on the economy. When wealth is distributed to poor people, they spend it on things that they need and want, and that spending fuels the economy. A progressive tax system that puts the heaviest burden of taxes on the wealthy would not only put more money into government which can then be invested in the commons, but also incentivize business owners to put more money back into their businesses, whether that’s paying their workers more, hiring more people, or getting their workers better educated. Redistributing wealth also means paying workers more, providing more benefits, and extending welfare for the unemployed. A bigger and better educated middle class means more financially secure people who can participate in democracy. It also means more people who are willing to fight for clean air, clean water, parks to play in, and healthy and safe neighborhoods. Internalize the cost of externalities: In economics, an externality is a consequence of economic activity that is experienced by unrelated third parties. For example, bottled water companies profit from selling bottled water, but the public pays the cost of recycling and disposing of all those plastic bottles. Utilities make money by burning fossil fuels, but they do not pay the cost of polluting the atmosphere with greenhouse gas emissions and causing global warming. Similarly, companies like Walmart that pay low wages and no benefits to their employees make huge profits by externalizing the cost of their employees’ healthcare and living expenses. Those employees have to have government assistance to survive, which amounts to a direct subsidy to the corporation from the government. Policies such as a carbon tax, extended producer responsibility, and mandating living wages and benefits for employees have the effect of correcting these externalities. If fighting poverty is good for sustainability, many sustainability initiatives are also good for fighting poverty, and those are the ones that we should prioritize. Public transportation is a prime example where environmental benefits intersect with economic development and social equity. CSAs and the local food movement give people access to fresh food and decreases the carbon emissions associated with modern industrial agriculture. Urban forestry captures CO2, reduces the urban heat island effect, and increases the aesthetic appeal of urban neighborhoods. The emerging sharing economy, exemplified by companies like Uber and Airbnb and social networks like Freecycle and Craigslist, promote reuse, sharing, and help put money back into the pockets of average Americans. Protests, direct action, and signing petitions are all ways to participate in democracy, which is our best tool for addressing problems at the system level. The divestment movement is such a strategy because it directly resists the corporations in their quest for profit at the expense of our commons. As hard as it is, we should take time to be educated and participate even if our capitalist society is not supportive of education or participation. We need to vote and have a say in decisions that involve the development or exploitation of our commons. We need to reverse the decision to let corporations have the same rights as natural persons and make unlimited contributions to political campaigns. We need to support progressive taxation and end tax cuts for the very rich, and resist cuts to education, welfare, parks and other aspects of our commons. And we need to bring back unions so that workers can fight for fair pay, better working conditions, and retirement benefits without fear of individual retaliation. I do not know if Luann Prokoff was able to pay for the heat this winter, the worst that the Northeast has seen in decades. Like many Americans, her children probably had to go without meals even as they lowered the thermostat. She probably had to choose between paying her mortgage or buying Christmas presents. Poverty depletes human capital, without which it is impossible to fight against the forces of greed and corruption that plunder the weak. The environmental movement must benefit people like her if it seeks to be a broad-based social movement that can seriously challenge the status quo. Abramsky, Sasha. The American Way of Poverty. Nation Books. New York. 2013. Page 19. Abramsky, Sasha. The American Way of Poverty. Nation Books. New York. 2013. Page 9. Hartmann, Thom. The Crash of 2016. Twelve, Hachette Book Group. 2013. Page 31. Abramsky, Sasha. The American Way of Poverty. Nation Books. New York. 2013. Page 26. Hartmann, Thom. The Crash of 2016. Twelve, Hachette Book Group. 2013. Page 81. Piketty, Thomas. translated from the French by Arthur Goldhammer. Capital in the Twentieth Century. Belknap Press/Harvard University Press. 2014. Neuhauser, Alan. “Oil spills aplenty since Exxon Valdez.” US News. March 25. 2014. http://www.usnews.com/news/blogs/data-mine/2014/03/25/us-racks-up-dozens-of-oil-spills-in-25-years-since-exxon-valdez Last accessed April 14, 2015. Cama, Timothy. “Greens: Obama caved on fracking.” The Hill. March 24, 2015. http://thehill.com/policy/energy-environment/236700-environmentalists-obama-caved-on-fracking. Last accessed April 4, 2015. Ritenbaugh, Stephanie. “EPA analysis details water usage in fracking in Pennsylvania.” Power Source. April 7, 2015. http://powersource.post-gazette.com/powersource/companies-powersource/2015/04/07/EPA-analysis-details-water-usage-in-fracking/stories/201504070016 Last accessed April 14, 2015. Koshgarian, Linda. “Cromnibus Winners and Losers: Renewable vs. Fossil and Nuclear Energy.” National Priorities Project. December 18, 2014. https://www.nationalpriorities.org/blog/2014/12/18/cromnibus-winners-and-losers-renewable-vs-fossil-and-nuclear-energy/ Last accessed April 14, 2015. Slesinger, Scott. “EPA Spending in the President’s Budget: Where Does the 0.22% of Federal Spending Go?” NRDC Switchboard. March 21, 2014. http://switchboard.nrdc.org/blogs/sslesinger/epa_spending_in_the_presidents.html Last accessed April 14, 2015. Cohen, Andrew. “How voter ID laws are being used to disenfranchise minorities and the poor.” The Atlantic. March 16, 2012. http://www.theatlantic.com/politics/archive/2012/03/how-voter-id-laws-are-being-used-to-disenfranchise-minorities-and-the-poor/254572/. Last accessed April 14, 2015. Efstathiou Jr, Jim and Mark Drajem. “Drillers silence fracking claims with sealed settlements.” Bloomberg Business. June 6, 2013. http://www.bloomberg.com/news/articles/2013-06-06/drillers-silence-fracking-claims-with-sealed-settlements. Last accessed April 14, 2015. Fisher, Max. “Map: How 35 countries compare on child poverty (the US is ranked 34th).” The Washington Post. April 15, 2013. http://www.washingtonpost.com/blogs/worldviews/wp/2013/04/15/map-how-35-countries-compare-on-child-poverty-the-u-s-is-ranked-34th/. Last accessed April 14, 2015. Wikipedia. “List of countries by carbon dioxide emissions per capita.” http://en.wikipedia.org/wiki/List_of_countries_by_carbon_dioxide_emissions_per_capita. Last accessed April 14, 2015. Klein, Naomi. This Changes Everything. Simon & Schuster. 2014. Page 61.